This week, Max left for England on his first business trip since Parker was born. He got some extra snuggles in the night before he took off. Luckily, my sweet mom was still here visiting so Parker and I had some very helpful company! It's so much easier to take care of little one with an extra set of hands! Plus, Parker just loved sleeping on grandma! My mom headed back to California Tuesday evening, and it was just me and the bean! We spent Wednesday at Scottsdale's posh Fashion Square mall. Little man was my lunch date at the Nordstrom cafe. He was such a good baby boy! Until, that is, we stepped foot in the elevator. Not. A. Fan. He was much happier after a nap! Later was facetimed with Max. Little man was confused as to how dad could fit inside my iPhone. On Thursday morning, I told Parker we were going to the dentist! He seemed happy. He ended up loving it! He sat in the corner and watched as I had my teeth cleaned and he loved the sound of the cleaning tools. I think this means he's going to be a dentist someday ;) He was so tuckered out from the fun that he slept through our facetime call with daddy. Finally, it was Friday! And time to welcome daddy home from the UK! 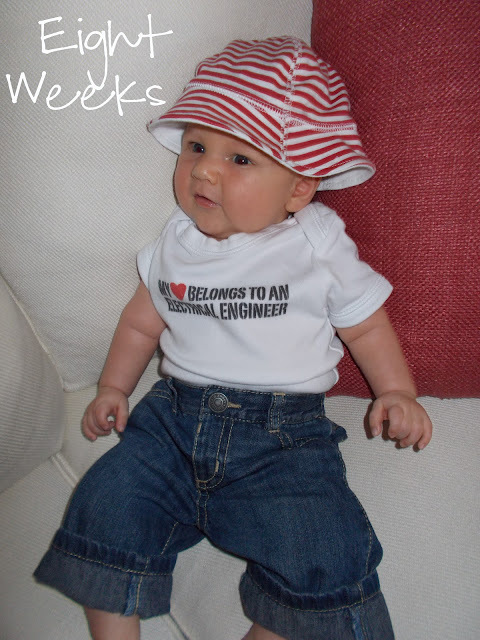 I dressed Parker for the occasion in a "My Heart Belongs to an Electrical Engineer" shirt my mom had gifted to him. He was a sleepy man! So sleepy that he snored right through Max coming home! Happy 8 Weeks, Baby Boy!